Reported benchmarks of Apple's latest A11 Bionic system-on-chip design, which will see release in the iPhone X and iPhone 8 series, show it outpacing not only current generation A10 and A10X chips, but matching the performance of some 13-inch MacBook Pro configurations, at least in terms of single-core processes. Officially announced to the public on Tuesday, iPhone X, iPhone 8 and iPhone 8 Plus units are apparently being tested in the wild, with users pinging Geekbench servers to evaluate the systems' performance metrics. 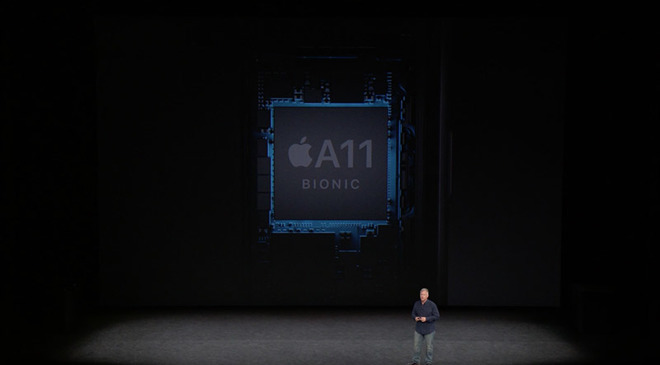 Identified as "10,2," "10,3" and "10,5," the iPhone models seen in Geekbench scores on Wednesday appear to run the same A11 Bionic SoC unveiled onstage at Apple's special event at Apple Park. The chip sports two Apple-designed high-performance cores, four high-efficiency cores and, for the first time, an Apple-designed GPU. In a series of 12 Geekbench 4 tests, minus what appears to be an anomalous reading, the A11 achieved an average single-core score of 4169 and an average multi-core score of 9837. By comparison, the A10 Fusion power the iPhone 7 Plus scores roughly 3514 in single-core mode and 5970 in multi-core processes. The latest 12.9-inch iPad with A10X Fusion processor, Apple's fastest currently available mobile chip, scores 3924 in single-core and 9371 in multi-core. With a single-core high water mark of 4274, the A11 Bionic rates just above a mid-2017 13-inch MacBook Pro running a dual-core 3.1GHz Intel Core i5, and a shade below a late-2016 15-inch MacBook Pro powered by a quad-core 2.9GHz Intel Core i7 as noted in Geekbench's Mac Benchmarks. As expected, Intel's laptop-class silicon blows away A11 Bionic in multi-core performance, with Apple's mobile chip reaching a high score of 10438, just above a mid-2012 15-inch MacBook Pro. In a statement to MacRumors, Geekbench's John Poole said he believes the A11 Bionic benchmarks are legitimate, saying the two high-performance cores are likely operating at 2.5GHz. The "25MHz" seen in Geekbench metrics related to A11 Bionic chips appears to be an anomaly, Poole said. The latest Geekbench figures follow an early benchmark that popped up on the service yesterday. At the time, the Geekbench 4 database showed a single entry for what now appears to be an iPhone X.
Apple's latest A-series silicon is due to arrive in the hands of consumers next week when the first iPhone 8 series preorders ship out to customers on Sept. 22.